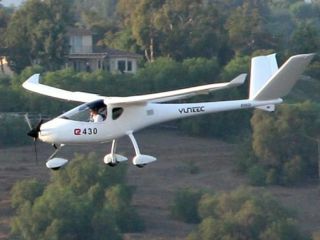 Sino-British aircraft company Yuneec has successfully test-flown the E430, the world's first electric two-seater plane, in Los Angeles. Last night, the E430 made its first flight as an FAA-approved experimental aircraft. Two flights totalling nearly two hours were completed successfully with a height of over 3000 feet being achieved from Los Angeles's Camarillo airport. Test pilot Dave Morss put the E430 through all the basic flight test manoeuvres and said he was very pleased with the way the E430 handled, so much so that he really enjoyed the second flight. Electric is a new era in aviation and there are concerns over various aspects of electric power, such as batteries, which remain to be fully regulated. The two-seater E430 uses a 40kW Power Drive 400 engine driven by either four or six 30Ah lithium polymer batteries. The aircraft is almost completely silent in operation, can fly for between 1.5 to 2 hours with four batteries, or up to 2.5 hours with all six. It can be recharged from normal 240V sockets, in around three hours. Flight tests will continue for the next two days after which it is hoped that the FAA will sign off the E430 for its journey to the annual Oshkosh Airventure show on Tuesday.